For our July social event we will be meeting for dinner at the Beach House on Sunday, 23th July 2017 at 6.00pm. 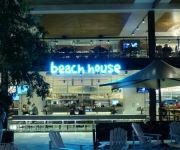 The Beach House is located on level 2 in the Town Square at Westfield Garden City near the Event Cinemas. There is plenty of free parking (if entering after 5:30PM) available right next to the cinemas. We are looking at booking our own separate section in the upstairs area, so please let us know by 16th July 2017 if you will be attending (and how many people). Please RSVP via the beekeepers website or text to 0417 637 434. We are hoping to see as many of you as possible!